Sometimes you just gotta get away from it all for a while, you know? 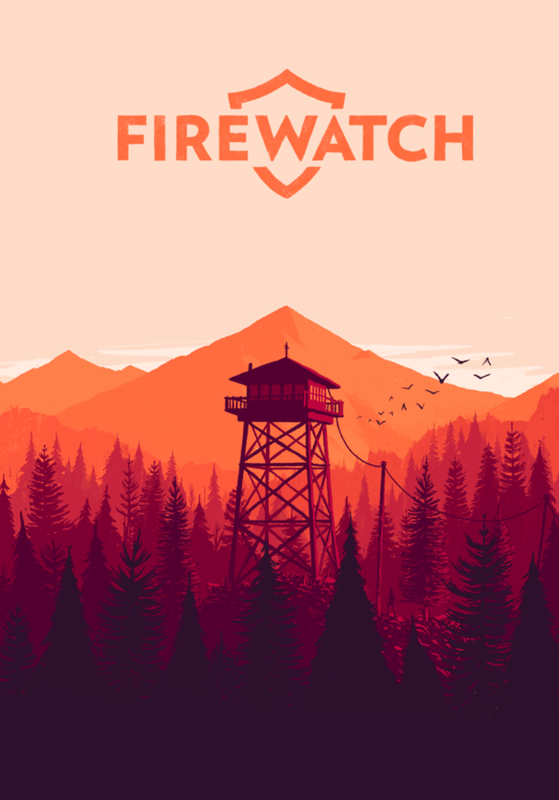 Firewatch is a game about escape, both physical and emotional, and it just so happens to be a lovely little escape itself. In a brilliant and moving interactive opening sequence, you learn you are Henry, a troubled man whose life is falling to pieces. Henry has opted to spend the summer of 1989 working as a fire lookout for a national park to escape that life and spend some time reflecting on his next move over the gorgeous vistas of Wyoming. From the starting moment, Henry’s first major means of interacting with the world is exploration as you hike the two days to his lookout in time lapse, then get acquainted with your new tower home and time period through interaction with objects in the environment. 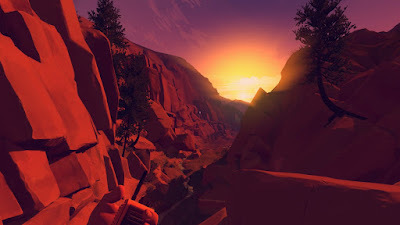 His second means is by way of direct player choice, beginning with a series of life decisions about Henry’s history and followed by the radio dialogue with his new boss, Delilah, that forms the core of his human connection in the midst of the Wyoming wilderness. The real-time conversational system feels like a more subtle, natural, and omnipresent evolution of the “ABC” Telltale menu integrated with a more mature and believable variant of the BioWare dialogue wheel. 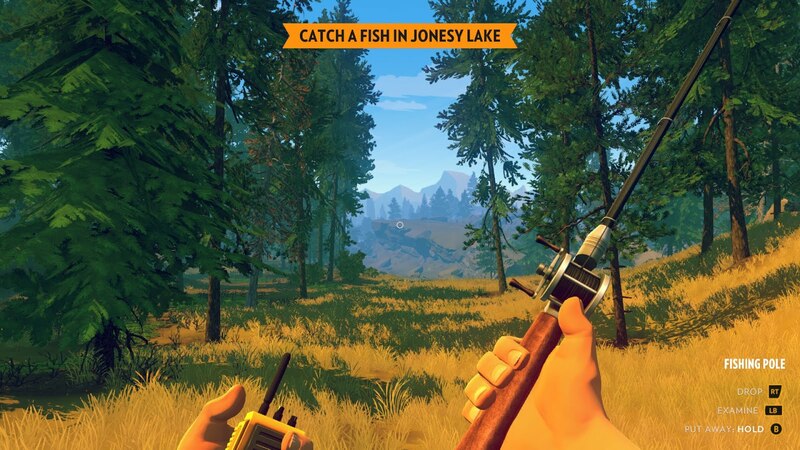 It’s an intuitive and fluid way to anchor the player to Firewatch’s story and characters, augmented all the more by a near perfect set of vocal performances and some genuinely funny and touching writing. Yes they are, Firewatch. Yes they are. The third major means of player interaction, and the one that feels both most beholden to and iterative upon Gone Home, is the direct control of Henry’s body and his second-to-second physical choices in the world. Having just recently experienced SOMA for the first time, I was almost giddy to find so quickly another game that captures the tactile feeling of its controls, extending in design philosophy here to a minimalist UI and a Far Cry 2-style in-world map and compass. The physicality of Henry’s animations and his freedom of environmental manipulation also go a long way toward grounding the player’s sense of presence and investment in his story. Like Gone Home and SOMA, much of that object manipulation is used to read inscriptions or gather narrative clues, but most of it exists to further that sense of player presence by fleshing out Firewatch’s natural grandeur with lifelife (mostly human) details. A man could get lost in this world. Especially if he has my sense of direction. It’s just one of many ways in which Firewatch succeeds at the level both of, if you’ll forgive me, the forest and the trees. 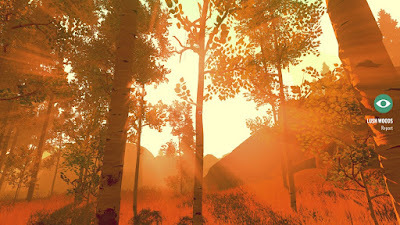 The natural grandeur is truly goddamn grand, making Firewatch a gorgeous game to explore and snap screenshots of, no doubt about it; the devs wink about this by quickly providing the player with a cardboard disposable camera with which to take in-game photos, yet another tactile anchor into the UI-free world. It somehow manages to evoke real awe at its colorful mountains and burning sunsets even while being hyper-stylized in a jagged, angular cartoon way reminiscent of Team Fortress and Wreck-It Ralph, particularly in the character design. 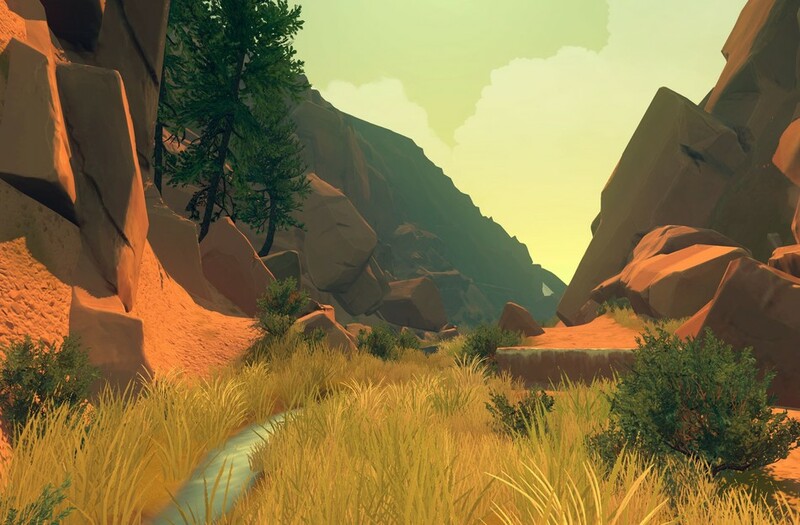 It would be nice if your journey were a little less constrained to trodden paths, and the narrative progression through them a little less linear, but given its production limitations Firewatch provides a commendable degree of freedom to explore. The only fire I need to watch for is the one you set in my heart. 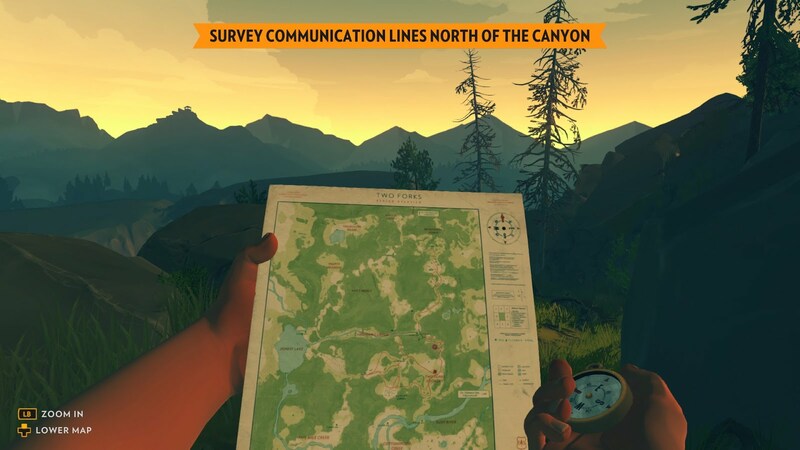 I’m happy for you, Firewatch, and I’mma let you finish. But first I’m gonna sit and stare a while. You mean you’re actually gonna make me work to get places? If Firewatch has one glaring flaw it’s that it doesn’t really deliver on all this emotional buildup. It crescendos to something of an anticlimax after unsuccessfully attempting to pull off Gone Home’s same narrative bait-and-switch, which now looks even more like a clever once-and-done “trick” of genre subversion that can never again be called upon with the same effect. There are other signs that development might have gotten a bit rushed in the final act, with environmental bugs showing their ugly faces for the first time, conversation becoming much more sparse for what feel like slightly contrived reasons, and narrative choices playing out in the finale in hasty and somewhat unsatisfying ways. 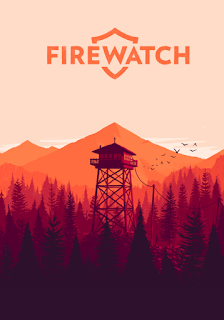 Disappointing conclusion notwithstanding, Firewatch has occupied my thoughts almost constantly since the credit rolled. 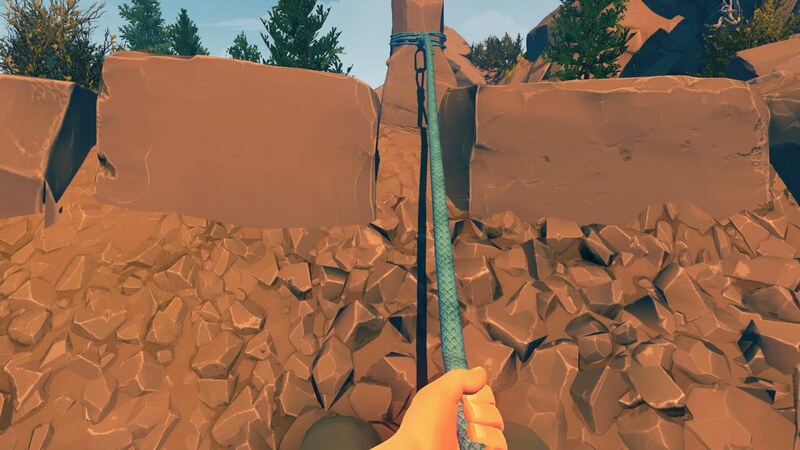 I’m tempted to hand-wring about its problems keeping it just shy of greatness or make some equally silly and premature judgment about its place in gaming history vis-à-vis release proximity and superficial similarities to something as affected as The Witness. The more honest truth is that I found Firewatch easy to love at its best and difficult not to recommend at its worst, and it doesn’t need favorable comparisons to a diametrically opposed game in order to shine.